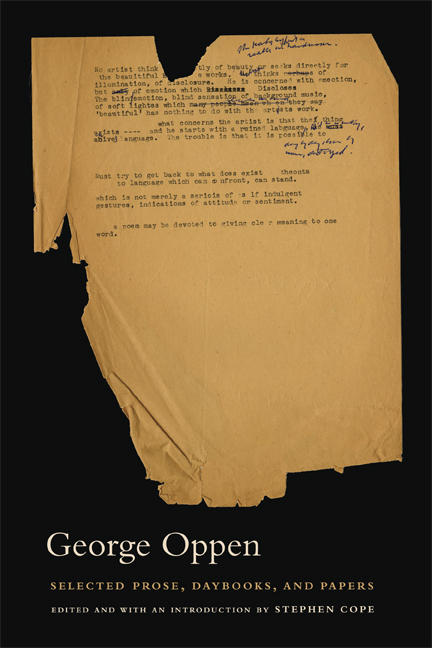 This is the first comprehensive critical edition of the unpublished writings of Pulitzer Prize-winning objectivist poet George Oppen (1908-1984). Editor Stephen Cope has made a judicious selection of Oppen's extant writings outside of poetry, including the essay "The Mind's Own Place" as well as "Twenty-Six Fragments," which were found on the wall of Oppen's study after his death. Most notable are Oppen's "Daybooks," composed in the decade following his return to poetry in 1958. Selected Prose, Daybooks, and Papers is an inspiring portrait of this essential writer and a testament to the creative process itself. George Oppen (1908–1984) was born in New York and died in San Francisco. He won the Pulitzer Prize in 1968 for Of Being Numerous. His work is available in New Collected Poems, edited by Michael Davidson (2002); Selected Poems, edited by Robert Creeley (2003); and Selected Letters of George Oppen, edited by Rachel Blau DuPlessis (1990). Stephen Cope received his PhD in 2005 from the University of California, San Diego, where he was a research fellow at the Archive for New Poetry, where Oppen's papers are housed. He has taught at universities in California, Iowa, and Ohio. A Note on Tom McGrath etc.